A ‘Buildings as Power Stations’ pilot manufacturing facility, launched recently by Business Secretary Vince Cable and Wales First Minister Carwyn Jones at Baglan Energy Park, near Port Talbot, puts the UK on the threshold of a £1 billion pound new industry which will revolutionise building construction and make a major contribution to renewable energy targets. Enormous environmental benefits also underscore the project, which could reduce the UK’s CO2 output by millions of tonnes a year. The technology focuses on new products which will turn buildings into power stations. The pilot production unit will develop functional coated steel and glass products to incorporate into existing and new buildings, enabling walls and roofs to generate, store and release energy. This will help address a widely-predicted global shortage of energy supply, providing building owners and occupiers with a reliable energy source at point of use. Opening the Pilot plant Energy Secretary Vince Cable said: “The Government’s £10million backing of the SPECIFIC project shows what can be achieved when world class university research comes together with the private sector. “This centre will speed up the commercialisation of innovative industrial coatings, creating a whole new manufacturing sector and new business opportunities, not to mention long-term environmental benefits, including turning buildings into sources of power. The £20m, five-year project at SPECIFIC, one of six IKCs in the UK, is backed by £10m funding from the Engineering and Physical Sciences Research Council (EPSRC) and Technology Strategy Board. A further £2m funding from the Welsh Government recognises the IKC’s strategic nature and potential economic impact, giving it added impetus. 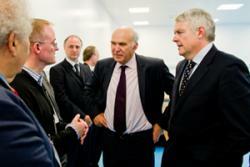 Dr Peter Holliman discussed his collaboration work with Business Secretary Vice Cable and First Minister Carwyn Jones.Dr Peter Holliman’s research group at Bangor University’s School of Chemistry, is working closely with SPECIFIC partners to develop low cost solar cells. Key targets are to increase light harvesting to increase efficiency whilst also addressing low energy manufacturing to reduce costs and embodied energy. The building integrated photovoltaics (BIPV) being developed will generate low carbon, renewable energy at the point of use. Excess electricity can also be sold into the National Grid turning electricity users into generators. This is a particularly attractive option for very large buildings such as retail parks, factories, warehouses, supermarkets. Commercial success for BIPV demands low cost solar cells which can be continuously manufactured on a large scale. This means each processing step must be very fast (minutes at most). However, reducing energy usage and cost means that the lowest possible processing temperatures must be used. Achieving this challenges a fundamental scientific fact, which is that chemical reactions happen faster at higher temperature. The challenge is to make things which takes hours to achieve at 500-600 °C take place within seconds or minutes at a temperature which is several hundred degrees lower. To date, Dr Holliman’s group at the School of Chemistry have filed nine patents in this area. WATCH A BRIEF VIDEO OF DR PETER HOLLIMAN EXPLAINING THE COLLABORATION BENEFITS HERE. “Bangor University has a long tradition of working with industry. A key role for the modern University is to bring commercial benefit to the area. Working alongside SPECIFIC provides an important exploitation route for Welsh innovation bringing expert scientists and engineers to the region to create wealth and jobs in Wales,” he added. Because this is a new industry, new jobs will be created and, for example, the engineers will need to have ‘green energy skills’. 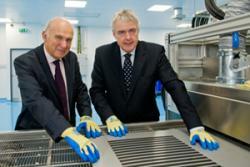 It is also likely that these new jobs will be created for people who live in the local area to service local demand. As residents start to introduce the “green solutions” into their homes, either for new build houses or retrofitting to existing houses, more developers and other companies will begin to enter the market; creating more jobs to meet the growing demand. New jobs will be created both in manufacturing but also in the supply and installation businesses, whilst also contributing to meeting 2020 renewable energy targets.